Back in April, Bloomberg infamously predicted that “half of U.S. fracking companies would be dead or sold this year.” Despite continued slumps in oil, the expensive extraction process of fracking has remained and will likely continue to stay for the foreseeable future. Numerous factors affect the profitability of fracking, but as time goes on, its productivity is proving more resilient than expected. Low risk, falling frac sand prices, reduced equipment prices, and already paid startup costs are keeping fracking in business. Initially it was predicted that fracking would quickly erode due to its high cost relative to traditional oil pumping. Fracking involves digging a well, and then pumping it with water, chemicals, and frac sand in order to extract oil from tough shale deposits. When oil prices were high, fracking was an attractive source of oil. As prices plummeted though, numerous fracking wells closed down, and it seemed as though the fracking industry would collapse. However, it is currently November and fracking is still a major producer of oil in the U.S. Why is that? 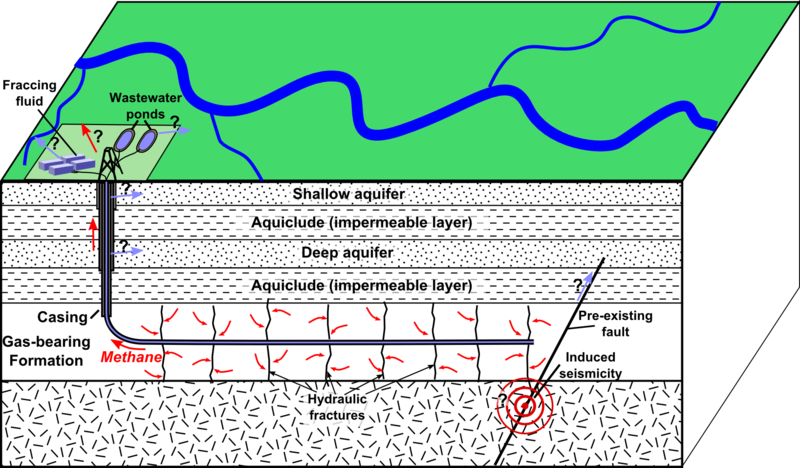 A diagram of horizontal well fracking. The irony for the fracking industry is that the more it struggles, the more profitable it becomes. Reduced demand for equipment, chemicals, and frac sand all translate into cheaper operation costs for those still in the industry. Frac sand, when pumped into wells, opens the small cracks in shale deposits and allow oil to flow. The more frac sand used, the more oil produced. Frac sand demand has dropped by 30-40% since the initial fracking boom, and this is making it easier for fracking wells to become more productive due to price drops. Closing wells is also causing a flood of equipment onto the market, reducing equipment costs. Falling operational costs is helping to allow wells to be fracked multiple times, boosting their productivity over a longer time period. As a result, it is often more economical to frack existing wells to become more efficient rather than to build entirely new wells. Fracking productivity is rising, its costs are falling, and funding for alternative oil projects is being slashed. Fracking has shown itself to be a proven and effective method of producing large quantities of oil, and that has its own value. The fracking bubble was bound to burst as oil prices stabilized, but that does not mean that fracking’s place in the energy market will disappear. Tags: Fracking, oil, operation costs. Bookmark the permalink. Previous post ← Economic Freedom Series: Why Do I need a Prescription for Contact Lenses?